There's no shortage of 'built in China' microphones these days, mainly due to the low manufacturing costs there. Design and quality control, though, are of huge importance when manufacturing abroad, and judging by their previous microphones, this is something that M-Audio take seriously. 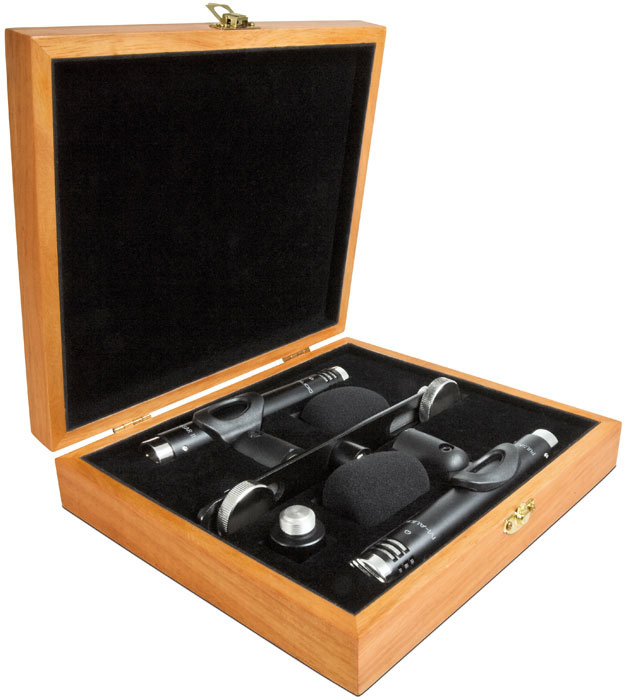 They've recently updated their original Pulsar small-diaphragm condenser, now called the Pulsar II, and I tested a matched stereo pair of them, which came in a nicely compact wooden box, complete with stand mount, foam shield and stereo bar. Shockmounts would have been nice too, but would no doubt have added to the cost. The Pulsar II is a simple end-fire, cardioid 'stick' microphone, and is equipped with a 3/4-inch diameter, six-micron gold-sputtered Mylar diaphragm. The capsule is housed in a brass body that's 22mm in diameter, with an overall length of 132mm, and weighs 115g. There's an integral shockmount system to isolate the capsule from any body vibration. The Pulsar II's frequency-response plot shows a nominally flat 20Hz-20kHz frequency response (-3dB), with the slightest hint of a presence hump around 7kHz. Like most such microphones, the preamp is based on a Class A FET (Field Effect Transistor) transformerless circuit, with a balanced XLR output. It uses 48V phantom power but can work on as low as 30V. The mic puts out 13.8 mV/Pa (-37dBV re 1V/Pa) and it can cope with levels up to 134dB — at which point the distortion rises to 0.5 percent — although switching in the 10dB pad via a recessed slide-switch in the side of the body extends this to 144dB. A second slide-switch operates the low-cut filter, which comes in at 80Hz with an 18dB/octave roll-off. The microphone self-noise figure is 15dB, A-weighted, which is 2dB quieter than the original Pulsar and quite respectable for a mic of this type at the non-esoteric end of the price spectrum. The cosmetic finish of the Pulsar II looks professional and smart, with black paintwork complemented by bright metal parts around the capsule and output XLR. As you'd expect from a small-diaphragm stick mic, instrument recording is its primary intended function, but it should record vocals perfectly well if you're not seeking added 'character'. M-Audio recommend it for acoustic instruments such as guitar, piano, brass, woodwind and strings, They also suggest using pairs as drum overheads, and for room ambience and most types of hand percussion. The Pulsar II matched stereo pair comes boxed with a range of accessories, including a stereo mounting bar.Other than spoken word — which I found the Pulsar II handled with no problems, as long as I used a pop shield — I tested the mic mainly with acoustic guitar: I usually find guitar recording to be quite revealing of this sort of mic. As ever, the choice of mic position is as important as just about any other factor when miking, but the resulting sound always turned out to be crisp and transparent, with no obvious tonal leanings. This lack of obvious character is by no means a bad thing, because mics of this type should ideally sound as transparent as possible (that's what makes them so useful!). Of course, that can also make it rather difficult to tell them apart on occasion, especially in this kind of price range. I also tried using the Pulsar II to record a range of percussion instruments, and discovered that it picked these up well, capturing the transients nicely and giving plenty of definition to the sound. Given the performance on percussion, a pair of these mics should also work pretty well as drum overheads (although I didn't have a kit set up on which I could test them during the course of this review) and I'd certainly be happy to use them for that. In fact, I wasn't able to find anything that these mics were actually bad at! If you're looking for a mic of this type, you really want it to be versatile and clean-sounding — and the Pulsar II certainly satisfies both these criteria. If you've a larger budget available, you'll be able to get a mic that has a better on-paper spec, but the fact remains that this little mic is capable of great results in a variety of situations — and perhaps just as importantly you won't need to break the bank to get hold of one. Some other small-diaphragm condensers in the same price range and worthy of consideration are the SE Electronics SE3, the Rode NT5, the Oktava MK012 and Sontronics' STC1. Good spec for a sensible price. A good all-round instrument mic for anyone on a tight budget. Pad and low-cut switches included. The Pulsar II makes a sensible addition to the M-Audio mic range and has a slightly better spec than the original Pulsar. It has a lot of worthy competition but it is nicely engineered, and can produce creditable results across a range of instruments — and the price is right, too. £129; matched pair £259. Prices include VAT.